As alluded to in my previous post, I have already completed a project in my new sewing studio. My husband and I celebrated our 5th wedding anniversary last week, and I just whipped this little number up (I've always wanted to be able to say that!) to wear out on our first child free over-night out in two and a half years (thanks Ga Ga!). It is a great fit and the fabric is really cool. I used two identical 40s (?) feed sacks I purchased at an antique mall in Maryland when I visited my mom back in March. 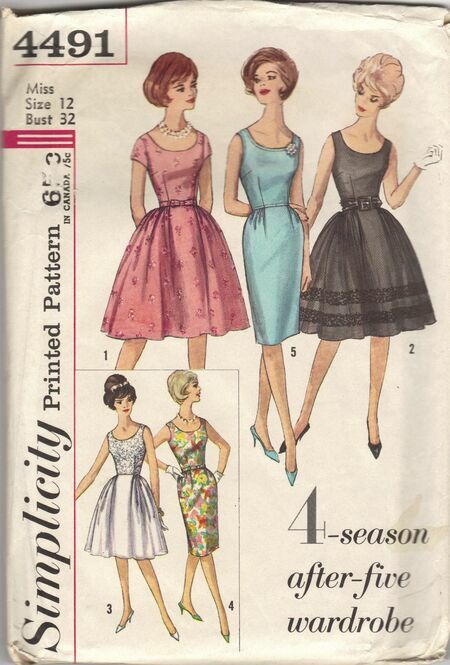 My original plan was to take Gertie's Bombshell Class on Craftsy and use that pattern. Well, I loved the class, and although I employed several of the methods Gertie instructs on in the construction of this dress, mine was not made as carefully as hers. In fact, it was made in a couple of hours spread over the three days before my anniversary. That's the "whipped it up" part. Also, I didn't use that Burda bombshell pattern. I am very small up top, and I just didn't like the way it looked on me. So, I used the top from Simplicity 4070. Ignore the horrific bubble dress. I am learning to look past the awful samples depicted on some pattern fronts. I moved the seams so they would be over my bust, as they were spaced too far out at the sides. I also shortened the bodice by one inch for my short waist, and "sweethearted" it a little more, as it seemed not so heart-y. To this bodice, I added the skirt from Simplicity 4491, which I know fits me well and is a style I like from having made it in my Daffodil Dress and in a leopard print as well. Of course, I double checked to make sure the bodice's princess seams would match the skirt darts and tucks, and then I shortened it a lot. A real lot. Getting old, but not willing to hang it up yet! I also put spiral steel boning in the bodice, moved the zipper to the side seam, lined the bodice, underlined the entire dress, included a waist stay, and sewed the zipper and hem by hand. Of the waist stay and boning, I must say I don't think I would have been comfortable in this dress without them. As Gertie says in the class, they are like scaffolding- that dress stayed just where it was supposed to, and I am one of those gals who always thought I didn't meet the requirements for holding up a strapless dress, if-ya-know-what-I-mean. In other related news, I received my copy of Gertie's New Book for Better Sewing in the mail yesterday. I am still reading through, but I think it is going to be a great resource for in depth techniques that my other sewing texts do not cover well. There are some really cute patterns to check out too. I'll give a full run down on the book once I have finished looking it over. Love the dress! It is beautiful, and looks great on you. ;) Congrats on 5 years! You look fabulous! This dress is totally gorgeous and it's made from feed sacks? How Coolidge that? And if you think your old, then I'm ancient ! This. Is. A Radio Test.